Another season down, another season to go. This upcoming spring looks a bit less stacked in comparison, but it’s not time to focus on that just yet. 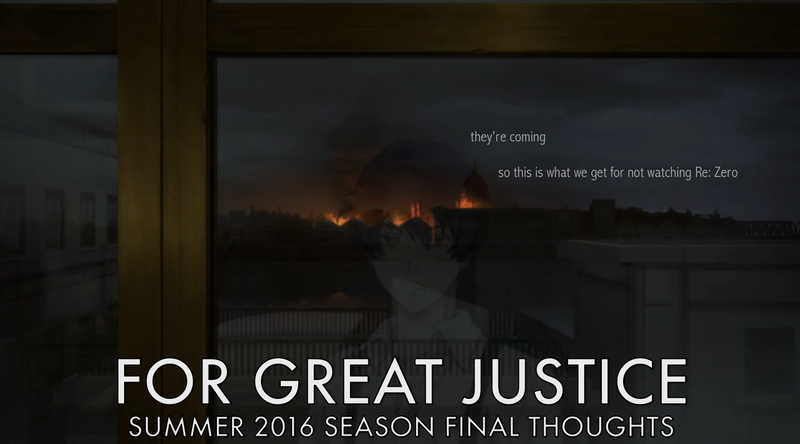 No, here Yata and Haru are back to wrap up their takes on the best this past winter had to offer…and a few other shows. Which ones were our favorites despite the stiff competition? Which ones ultimately let us down? How do they all stack up? 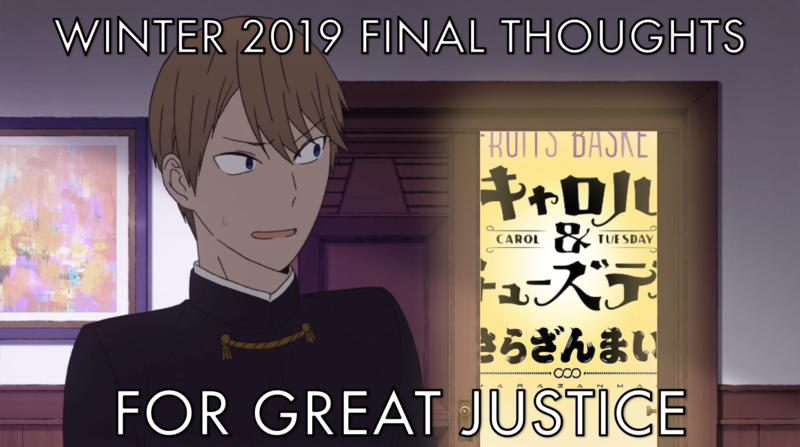 Find out below in our winter 2019 final thoughts. 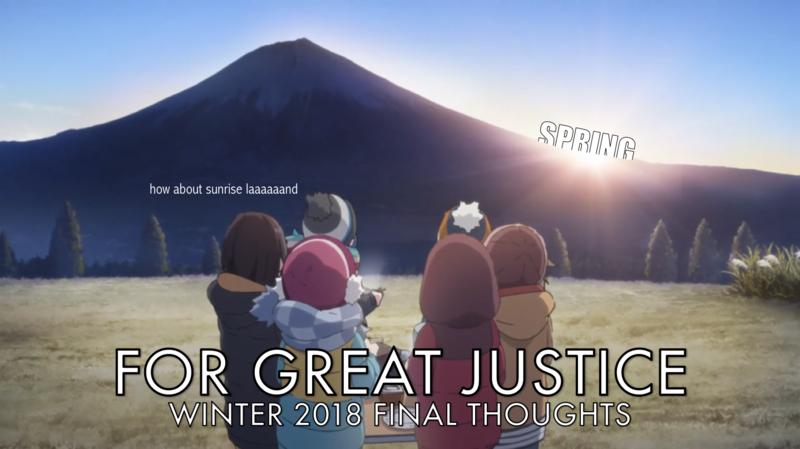 Spring is just around the corner (if not already here), but the Megalo Boxes and Special Weeks and Tri Hero Academias can wait just a while longer: first things first, winter has ended, and what a winter this season was. 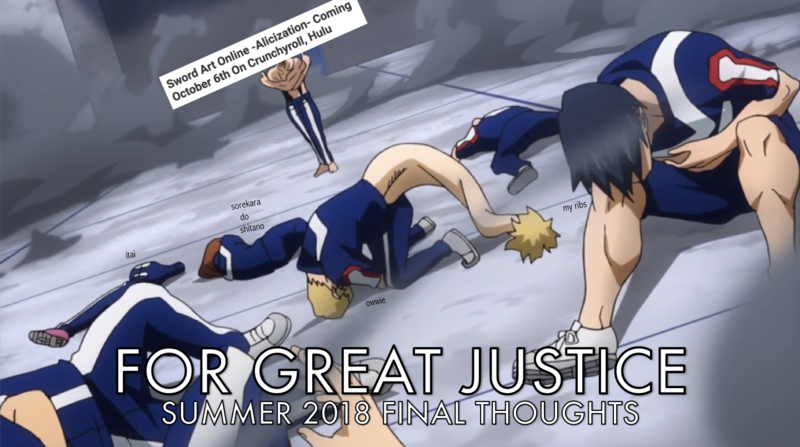 This seasonal transition period was a bit tight, though: Yata and Haru both watched more than what they had time to cover here, but hopefully the quality will outweigh the quantity. 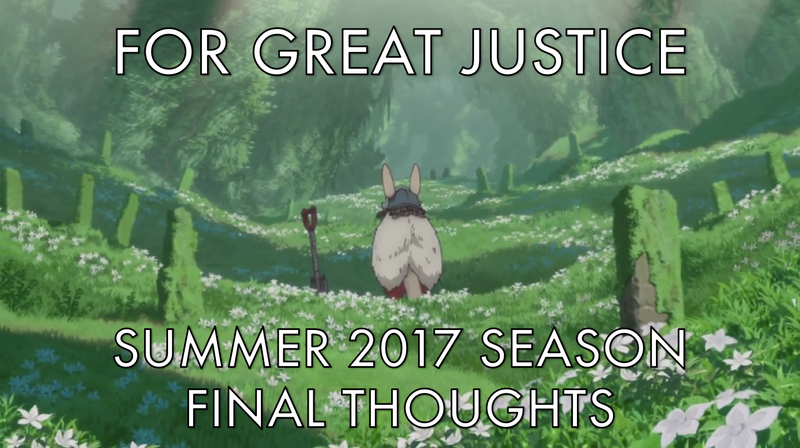 The outcomes probably won’t surprise you either, but find out below what For Great Justice loved and simply put up with as this noteworthy winter anime season came to a close! 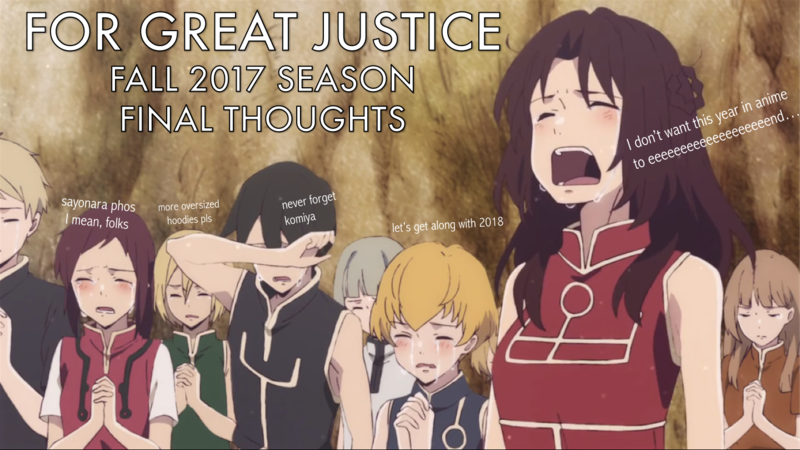 Oh, quit yer cryin’! 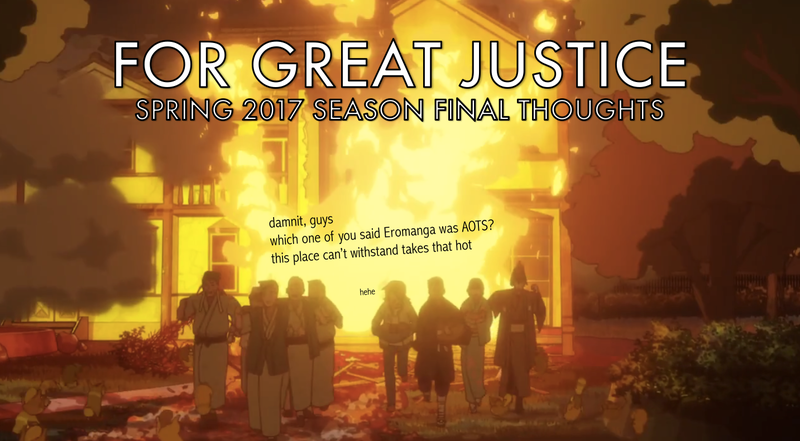 Yeah, 2017 was great, and this fall was stacked in particular, but all good things must come to an end. With the new year practically on our doorstep, we can’t wait forever to wrap up our final thoughts on this season’s offerings. Which shows stuck the landing? Which ones did we awkwardly watch faceplant over and over? And – could it be? Is there a 10/10 lurking below? We’re sure you’re looking ahead to 2018 by now, but the fall needs closure, and Yata and Haru are here to give it to ya. Welcome back, everybody! 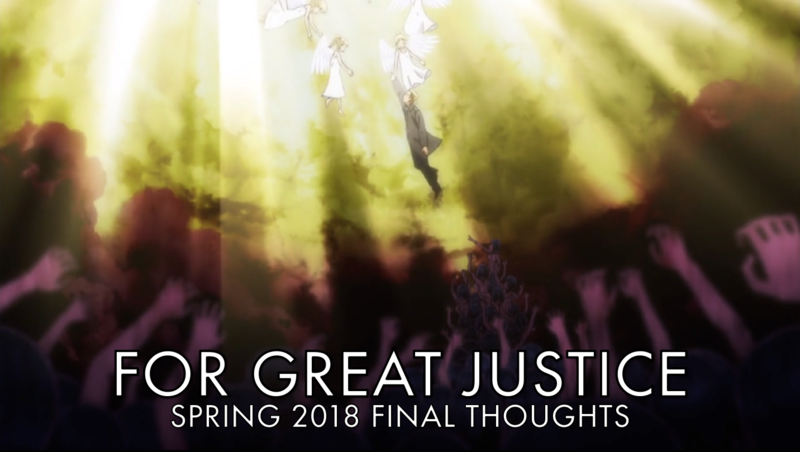 Spring’s already encroaching on the end of the winter season, but when it comes to jotting down some thoughts about anime, we’re better late than never. It also couldn’t be helped that Miss Kobayashi’s Dragon Maid didn’t wrap up until a couple hours ago, so while we’re kinda down to the wire here with the seasonal overlap, what would be the point if we didn’t include all that we enjoyed? 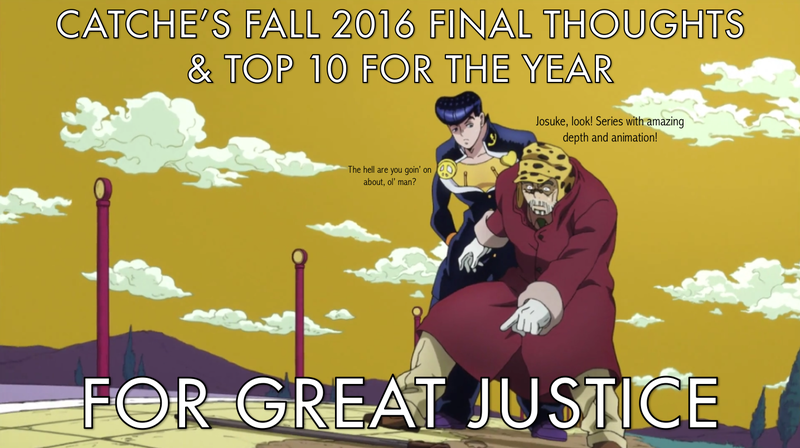 And what a surprising season it was, with several speculative picks taking off strongly, a couple solid sequels under its belt (2017 truly does look to be sequel heaven), and even our first 10/10 rating in about 2 years. What took that crowned spot? Where did everything else we watched stack up? And most importantly, what’s already contending for the most ridiculous surprise of the year? 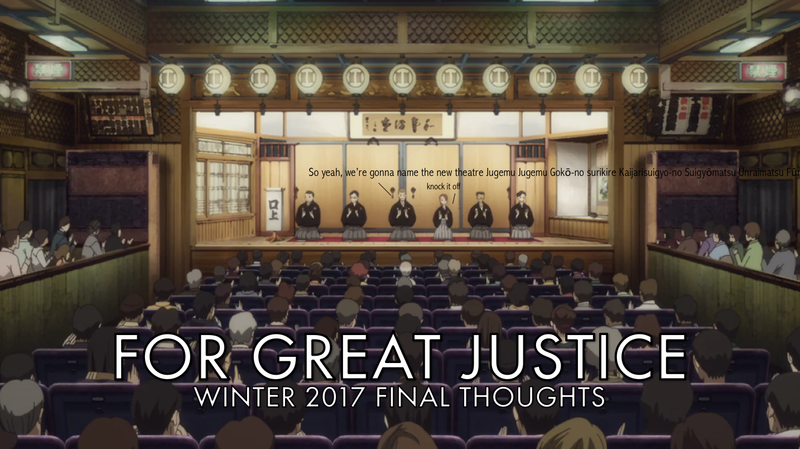 Kick back and read on as Yatahaze, Catche, and Harubruh run down their winter 2017 final thoughts.